Post-war US architect, interior and furniture designer. During WWII, he was involved in camouflage and in the design of military and medical installations. A member of the American Designers Institute (ADI), he joined Alfons Bach and Ben Nash to lead the 1944 relocation of ADI's administrative offices from Chicago to New York, by filing an application granting a new charter of incorporation by the state of Delaware. 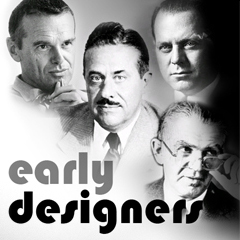 That same year, along with John Vassos and Ben Nash, he developed an ADI prototype curriculum for industrial design education, based on a survey of its members. This became the model for most post-war design programs. We are looking for an image of George. If you have one please contact us.